There are two types of Sai in Naruto Online game. One is normal Sai and one more will be Sai [Great Ninja War]. At the beginning, when Sai was introduced he seemed to be emotionless cold guy due to the training he went through as Anbu in Roots. He replaced Sasuke in Team 7 after Sasuke defected from the village. 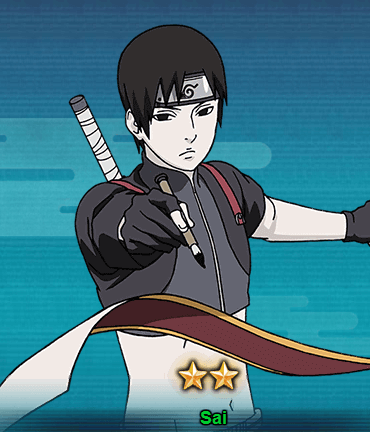 Sai made a huge contribution during the Fourth Shinobi World War with sealing the reincarnated ninjas. Let’s take look at the abilities of Sai. Taijutsu Super Beast Scroll – Raging Lion [Prompt]: Summon 2 Super Beast Imitation Drawing – Lions to fight for you. Lions are capable of Standard Attacks. Taijutsu Taijutsu Attack: Attacks the opponent’s front row and has a chance of a 3 COMBO and cause Knockdown. Ninjutsu Super Beast Scroll – Falcony: Chases and Attacks a Knocked Down unit, causes Repulse. Passive Ninjutsu Super Beast Scroll – Armor Collection : When at least 2 Lions are in the field, replace this unit’s Standard Attack always cause High Float.